Felix Connect has the capability to integrate any device or service with the Felix platform. It is the core data aggregation portal for an IoT solution built with Felix. Data Aggregation is the most fundamental capability provided by an IoT Solution platform. Just because it is a basic requirement doesn’t mean all platforms connect to devices and aggregate the information from those devices equally. Felix Connect services provide the most connectivity options with the highest levels of security available. Every device communicates with Felix Connect services using an encrypted channel. Each device must present an authenticated key to Felix before information from the device will be accepted. If a given device cannot meet these requirements an adaptor can be run at the edge (on the clients network) to perform these functions on behalf of the device. Additional device protocols (Zigbee, ZWave, proprietary, etc.) can be support through the use of adaptors running in the cloud or at the edge. In some cases, device information can be attained via cloud-2-cloud integrations. For example with SmartThings, Nest and others. Devices of various types from different manufacturers with different model numbers will all send information in different formats. 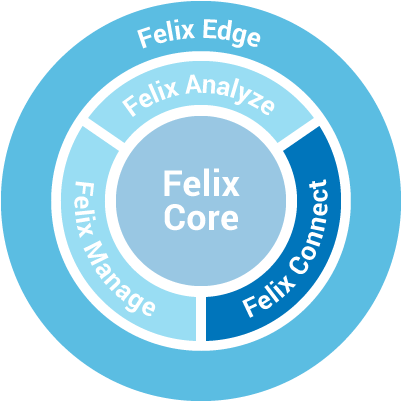 Felix Connect uses adaptors to transform raw data from various devices into a canonical structure that can be processed by downstream services, including the Felix real-time analytics engine, regardless of what device provided the data. These adaptors can be created and installed and updated dynamically while the platform is processing information reducing downtime and maintenance overhead. The Felix Connect services will persist the raw data from any authenticated device regardless of whether or not that data can be transformed into the canonical model. Persisting the raw data facilitates the automated provisioning of new devices and allows for the creation of “replay” and “what-if” features. An authenticated device can send information to Felix without any prior configuration being done in the Felix platform. In this case, Felix Connect will auto-provision the device in Felix and persist any raw data sent from the device. Once auto-provisioned, a user of the Felix platform simply has to complete minor configuration items and enable the device to begin fully processing its information. This automation dramatically reduces the amount of effort required setup a large IoT Solution using Felix. Supporting a wide range of device protocols natively and having the ability to easily create and support protocol adaptors both in the cloud and at the edge, Felix Connect services give Felix the ability to communicate with virtually any device or service imaginable. The Felix Connect services are horizontally scalable giving an Felix IoT solution the ability to support millions of heterogeneous device connections simultaneously. Requiring both transport layer security (TLS) and application layer authentication for each connected device, sending information to an Felix IoT solution through Felix Connect services is both safe and reliable. The automated provision feature of Felix Connect services is key to successfully providing large-scale IoT solutions with the Felix platform.